The writing process is incomplete if you cannot edit the written piece properly. Regardless of what you are writing, the need to become a good editor is always present. Luckily, there are many books that can serve you as a guide on the path of becoming a better editor. Including nearly 250 entries, the 2016 version of the Associated Press Stylebook is one of our top choices when it comes to perfecting your editing skills. The 2016 edition of this stylebook is widely used in classrooms, newsrooms, corporate offices and by writers worldwide. It was initially published in 1953, after which it received numerous updates. This book is now considered to be the ultimate resource for journalists, writers, editors and students. This book is the perfect solution to those who want to edit their novel. After you have written the first draft of your book, you must continue with the fixing process. Story fix is the perfect choice if you do not know how to do the final fiction revision. This book is filled with techniques from acclaimed authors, which will allow you to develop a good mindset, navigate the story and execution, strengthen the story and increase the tension. Whether you write book reports, articles, short stories or business plans, editing is a crucial step you must go through before publishing. This is why The New Your Times Manual of Style and Usage has been now updated to its fifth edition – to make sure that you are answered every question you may have regarding the writing and editing process. The guidelines presented in this book are based on grammar, meaning, spelling and punctuation. They also include capitalization and hyphenation. Additionally, the revised version of the original guide is now updated to assist you in citing blogs and links, using current terms and handling social-media content, such as twitter. Reading Like a Writer is a passionate book that uses examples from the work of the best writers that ever lived, including Kafka, Dickens, Dostoyevsky, Flaubert, Chekhov and Woolf. The reason why Prose picked the most beautiful writings of all times is to uncover why their work maintains to be the best. Prose speaks of plots and dialogues trough the work of Carre, detail-telling trough O'Connor, and character creation trough Joyce and Mansfield. This is a book that will inspire you to read more in order to write the perfect piece on your own. This book is a manual for both experienced editors and new writers who want to understand the crafting and editing of a good piece of writing. The Copyeditor's Handbook is used both as a copyediting textbook and as self-instruction book. It has a lot of exercises, accompanied by line-by-line explanations and answer keys. The third edition of the Copyeditor's Handbook includes all major updates from other manuals for editing, a revised chapter that states useful resources for editing and additional updates regarding technology-driven editing changes. This book is the best-selling dictionary in America and one of the largest published dictionaries in the world. The newest version is completely revised and now available both in printed version and ebook. Being in print for more than 150 years now, the Merriam-Webster dictionary now covers over 75000 terms, including word origins, synonym lists, and pronunciation. If your current skills need some polishing, the McGraw-Hill Handbook is the perfect choice for you. Precision in language can be the key determiner on whether your writing will become published or accepted from others. This is why this handbook gives you tips, rules, and definitions that will assist you in remembering the grammar lessons you heard so long ago while at school. The second edition of the McGraw-Hill Handbook is updated in terms of grammar, including one special chapter dedicated to grammar and digital communication. This chapter speaks of e-mail, social media, technology and texting. This book's eight edition introduces you to a great range of book formats, such as printed writing, online, e-book and even audio versions. This version is shorter than the previous ones, in which there were separate instructions for each format. The purpose of shortening this edition was making it easier to use, while in the same time guiding the writers trough the evaluating process of their research. The MLA Handbook teaches writers how to cite sources, edit the text and create entries. Kennedy has written the Showing and Telling in Fiction book in order to explain how one should write the perfect fiction piece and edit it before publishing. The chapter five of this book actually provides the reader with practical editing tips, while chapter three explains how to write the first draft of the novel. 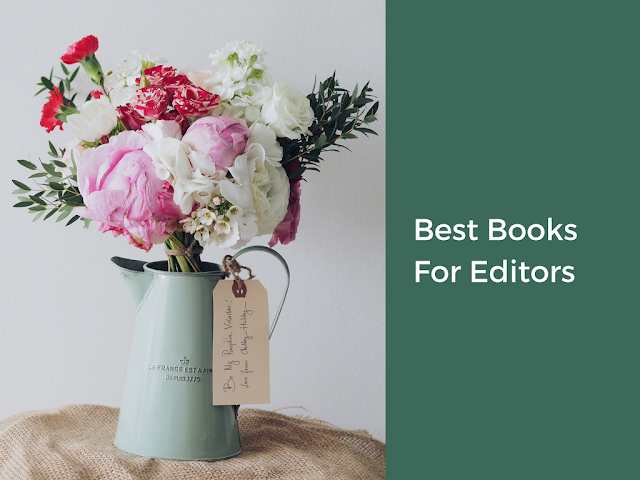 These are the 10 best books that can serve as a guide in your editing process. Julie Petersen is a blogger who writes about the latest educational and career trends in her articles. She works as a writer at NinjaEssays Writing Services. Julie is also running her educational blog where she shares her Ask Petersen essay sites reviews, writing samples, recommendations and college hacks.